In August of 1982, aged 22, Marvel Comics fan Randy Schueller received the following letter from then editor-in-chief of Marvel Comics itself: James Shooter. 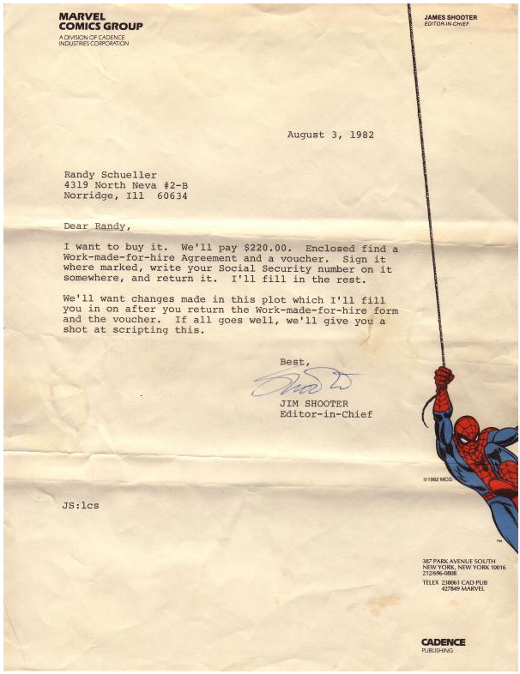 The letter, which boasts a stunning letterhead and simply begins 'I want to buy it', was sent in response to an idea Randy had submitted to Shooter's offices; an idea which resulted in Spider-Man donning a black costume for the first time in issue 8 of Secret Wars. Over the years this evolved to become Venom, the symbiote which starred in 2007's Spider-Man 3. Randy was happily paid $220.00 for his input. Randy's recollection of the affair can be read at Comic Book Resources. I want to buy it. We we'll pay you $220.00. Enclosed find a Work-made-for-hire Agreement and a voucher. Sign it where marked, write your Social Security number on it somewhere, and return it. I'll fill in the rest. We"ll want changes made in this plot which I'll fill you in on after you return the Work-made-for-hire form and the voucher. If all goes well, we'll give you a shot at scripting this.